The challenge for TV networks today? It’s not just single screen engagement with their audience anymore. Gen Z and Millennials, in particular, are notorious for their dual-screen behavior -- they’re scrolling their phones while they’re watching a show, they’re participating in online conversations in and around what’s unfolding on-screen in real time. It’s not enough to just make great TV anymore. Now, the TV show is just the start of the conversation. Viewers want the inside track on the cast, plot lines, behind the scenes -- and above anything, they want to be a part of the story. Instagram Stories fits perfectly into this space for WE tv: They’re continuing the conversation with their audience that their TV shows begin, they’re letting them be a part of the story, and they’re creating real human engagement around the people on the shows. With almost 200k followers on Instagram, WE tv is finding success on Stories by trying new things every day and learning what works for their audience. We caught up with Jana Amchin and Lori Hiller from Definition 6, the storytellers behind the WE tv Instagram handle, to get the inside track on how they approach Instagram Stories, how Stories fit into the overall social media mix, and what they think makes or breaks a brand’s Stories strategy. Here are six lessons from Jana and Lori on Instagram Stories. The life of a marketer has certainly not gotten any easier over the past few years. Different channels have exploded, audience behavior has fragmented, and content has become a constant need. From Jana and Lori’s experience, being busy means investing in tools to help streamline the low overhead tasks and focus energy on areas that truly create value for your audience. “We manage all of the social handles for WE tv. Day-to-day the two of us are writing copy, performing community management, and scheduling content on Twitter and Facebook, and Instagram Stories and Snapchat. That’s where Mish Guru comes in! We manage 7 Instagram accounts for our different shows, though not all of them are in-season at the same time. On average, we post about 15-20 Instagram Stories total each week. To be honest, we don’t know how we do it! The days of reporting on likes and video views are beginning to fade. That’s because a view, like, a follow - are passive engagements. According to Jana and Lori, what we want to be paying attention to as marketers are the active engagement metrics that show what content your audience wants to watch all the way through, want to comment on or share with their friends. 3. Instagram Stories Are a Piece of the Puzzle - But That Piece is Growing. Social media marketers know that their audience behaves and engages in different ways on different platforms (mainly ‘cause social media marketers are really freakin’ smart). So, they know their content needs to be developed and produced with those behaviors in mind. Instagram Stories are no different - they give a huge opportunity for brands to engage and build conversations around the stories that are real, in the moment, and allow their audience to be a part of those in real time. They’re a piece of the social media puzzle that’s increasingly important - something WE tv is experiencing over and over again. “Instagram Stories is a critical platform for WE tv. We do a lot of live coverage at premiere parties and shoots with celebrities, and through Stories our fans are able to follow along and interact in real time. 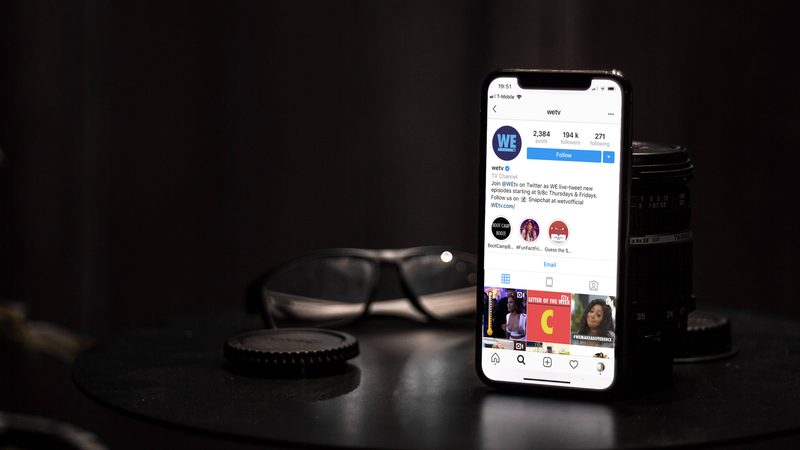 Our massive follower growth on Instagram has required us to put a huge focus there, as that’s where we see the future of our audience engagement lying. Audience research on Gen Z and Millennials, in particular, tells us that when it comes to social media, they want to be a part of the story. Better yet, they want brands to give them a story to tell. That’s why WE tv uses Instagram Stories as the medium to give them a voice. One of the most exciting things about working in a field like social media is the real-time audience feedback you get on content - that means if you’re paying attention, you get to paint a very rich picture from your performance insights about what works for your audience. The ephemeral nature of Instagram Stories means that you can test and learn on an even more frequent basis, propelling that understanding at warp speed. Lori and Jana recommend capitalizing on the 24 hour time window of Stories and using it to learn what works. “Our main advice for brands wanting to integrate Instagram Stories more into the social media mix is, have fun! Stories are only live for 24 hours, so you have the chance to try something new and learn from it every day! Lastly (and promise we didn’t pay them to say this), Jana and Lori have integrated Mish Guru into their workflow on Instagram Stories. They say it has helped them get their lives back on nights and weekends that they’d normally spend posting, increasing audience conversations through the collection and reposting of User Generated Content and learning what works for their audience - meaning increased follower growth and engagement. If you want to chat more about how Mish Guru could help power Instagram Stories for your business, get in touch with us here.